Gardaí have said the suspicious package discovered this morning at a postal sorting office in Limerick appears identical to parcels sent by dissident republicans to the UK. In a phone call to the Irish News in Belfast earlier this month, the so-called New IRA said it had sent the packages. The caller, who used a recognised code word, claimed five such devices had been sent, but only four had been discovered, three in London and one in Glasgow. Gardaí believe the package discovered this morning at the An Post depot on the Dock Road in Limerick was returned through the postal system after it failed to reach its destination in the UK. The office is the National Return Letter Centre, which acts as the depot for all undeliverable mail in the country. Staff contacted gardaí after the package was discovered at the depot at around 6am and the building, with over 100 staff, was evacuated. The Army Bomb Disposal Team attended the scene and made the device safe. The device, which was contained in a plastic envelope, was then handed over to gardaí for examination. Minister for Justice Charlie Flanagan said the postage stamp used could be similar to those on the other devices. Speaking on RTÉ's Today with Sean O'Rourke, Mr Flanagan said gardaí were working to determine if that was the case. He said the sending of letter bombs was a "totally unacceptable act". Minister Flanagan said heightened tension in Northern Ireland as a result of uncertainty over Brexit has resulted in the letter bombs being sent two weeks ago. In a statement, the Met Police said it was "aware of reports of a suspicious package being discovered ... at a postal depot in Limerick, Republic of Ireland". "We are in liaison with our counterparts in the Republic of Ireland as to whether this may have any connection to our ongoing investigation into devices received in London on 5 March and the device received in Glasgow on 6 March. "Our investigation into the three devices found in London continues alongside the Police Scotland investigation into the device found in Glasgow. "No arrests have been made at this stage and enquiries continue. 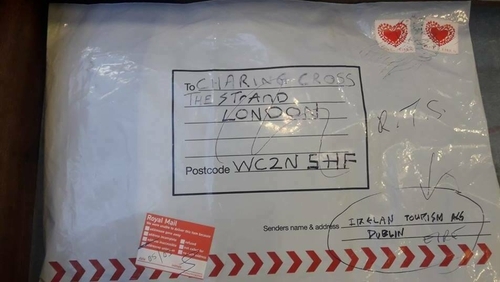 "Following the discovery of the devices on 5 March in London, extensive advice was issued to relevant businesses and sectors across the UK to be vigilant for and report suspicious packages to police. "This advice remains and we continue to urge the public to be vigilant and report anything suspicious to police."